It feels great to return to Mommy & Daddy School posts after a 2-week hiatus here at Pars Caeli. We've been learning and doing, and I'm excited to share and to announce a fantastic giveaway for you + a wonderful little person in your life. Leading up to the fourth of July my kiddos were all about maps and travel and puzzles. So, we wrapped all of that curiosity into a fun week of learning about the world and our special place in it. For those of you just joining us on this adventure, let me just say that my hubby and I are former teachers who love to learn alongside our kiddos, and we take full advantage of this in the summer. However, we also both work full-time and believe in encouraging our children to try new activities in the summer months. The long and short of it–we, like so many other American families–have to find ways to squeeze in, maximize, and set aside intentional time to learn. When trying to juggle professional demands, swim lessons, camps, nap schedules, and the other 12 things that come our way every day, this can be t-ough. And we're not miracle workers...just parents with a lot of high hopes so let me share with you our ways we immerse ourselves in learning. Maybe you can use these, too?! 1. Use every tool at your disposal in the library. Libraries are still the best, beautiful place to find dazzling information. You can read, listen, create, craft, eat, drink, compute, and entertain in ours (it's really not mine, I just visit 3 times a week). Trying to consider the developmental levels and interests of my three, we headed to the board books, picture books, and chapter books to see what we could discover about the United States. We also explored the non-fiction section, and each child selected a book about their favorite state. Great patriotic reads and simple historic books abound. Over at music we found great CDs of Americana set to tune. Schoolhouse Rock (a little too old for our kids) has some great stuff, and we found other simple movies/shows about the US. We could have explored maps, puzzles, computer games, magazines, audio books, and more, but kids need snacks, too, so we left with our stack of 20 books/CDs. How great is that United Tweets of America, Twitter friends? It's a charmed book with a page for each state bird. 2. Time learning in the car is not time wasted. We have a lot of life stuff to meld into our summer learning so, like it or not, we spend time hauling to and fro in the minivan. One of the ways we continue learning during transit is through music. There are so many great CDs with toddler tunes, nursery rhymes, children's stories, pneumonic devices, and, in our case for this week, patriotic songs. So we played these melodies over and over and had some great sing-alongs while sitting at the traffic lights. Hearing my 5-year old sing that Grand Old Flag was a hoot! 3. Technology is your friend in small quantities. I love technology, but I know that my children need it in small doses for real learning to take place. We encourage digital learning, and we allow our three kiddos time on the computer, Ipad, and Iphones. Two great apps that we utilized for learning this week: Stack the States (great for adults, too!) and Learn the States (so many great variations). This is my favorite children's atlas. Lift the flap! Along with these, we coupled real maps and altases. Breaking out the world map, we pressed sticky dots on the states and countries where are friends and family reside, and we were able to talk about the places that grandmothers and great grandmothers traveled from. Really a lovely exercise in story telling. 4. Make your toys work for you. Those blocks can make a great compass rose. Take the Matchbox cars for a pretend drive along Route 66. My Little Ponys can help the settlers pretend to discover the country in your dress-up gear. You get the idea. When we started this theme, I thought, what can we use around that we already have? Thinking I'd come up empty handed, I went on a hunt and found map puzzles, talking globes, and a whole host of other toys we could adapt for this learning experience. The kiddos, especially the 2-year old, loved playing with old toys in new ways. 5. Parents are the first learners. Children can read our enthusiasm (or lack thereof), and nothing hits home as well as when they see Mommy & Daddy learning something new themselves. I find interjecting (short) stories of my first learnings or retelling of "when-I-was-5-years-old" is really helpful as it relates to content. Knowing the song Mommy learned to remember all the states is more fun. Learning of how Daddy experienced New Mexico makes the state come alive. On top of that, we try to investigate questions within our learning that my husband and I also want to learn. What is our state flower? Should we include one in our landscape? How long would it take to do that cross country roadtrip we're dreaming of? Sharing these questions with our kids, and allowing them to follow our thought processes and tools for investigation lets them know we care about learning so much we make time to do it, too!! And on that happy note, I'm excited and delighted to announce our first big giveaway!! Through the generosity of the lovely Mariah Bruehl of Playful Learning, one lucky winner and their incredible young person will win a spot in the creative Ecademy series, Through the Lens. I've enrolled M, and she'd love to have a great new classmate! To win, please leave a comment below. If you want a bonus second chance, send out a tweet about @parscaeli and @playfullearning, and we'll give you extra credit! The winner will be announced on Monday because I love happy announcements at the start of my week. Good luck!! Congratulations to Sandra! This giveaway is now closed. Stop back again for more goodness! 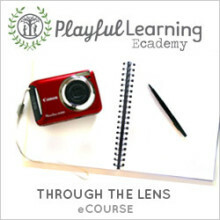 Through the Lens: Explorations in Photo Journaling, Wednesday, July 18 - August 8, is an e-course that has been created for children (and their grown-ups) ages six through twelve. Participants will gain new understanding of themselves and the world around them by exploring a variety of photography and writing techniques while creating and adding to their own photo journals. The goal for this e-course is to nurture positive self-expression through photography, writing, and art—to discover and develop a strong sense of voice. It is also a wonderful opportunity for parents and teachers to join in on the process and to connect with their children or students in new and exciting ways.